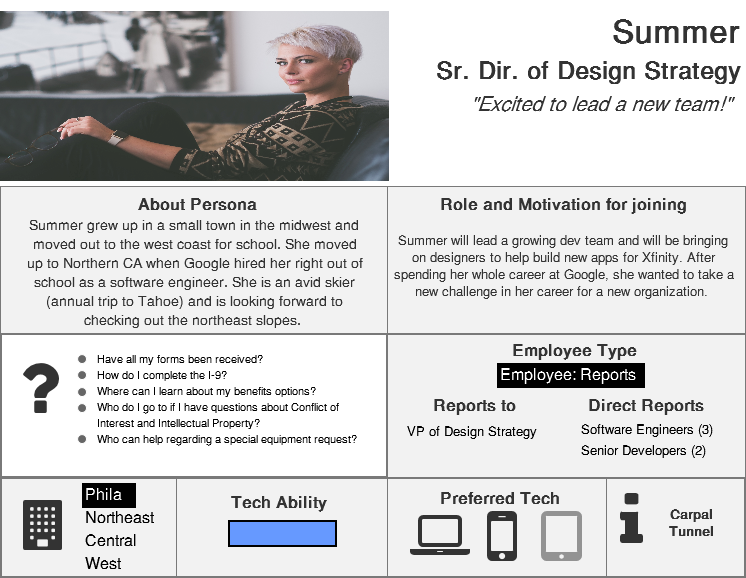 UX Designer tasked to research, build the content, and create initial employee personas. I walked through scenarios in various employee roles (employee, manager, HR) to get an understanding of how the employee would interact with the app. This also helped me determine the core component to differentiate each persona was their role. I tried to find articles on building out employee personas. Much of the literature was for general persona development. There isn’t a ton of research on building employee personas. Hopefully this can add to the User Persona Canon! I took my initial sketches and started creating different persona wireframes using Axure. My initial wireframes had 3 different personas based on what the research demonstrated were different type of employee roles accessing the employee portal. My focus was less on placement and design and more on ensuring we have the required content. I broke down each potential role and how they differed in the systems they would access in a spreadsheet. Before I sent my designs to the UI/Visual Developer on the team, I threw on some images I pulled from Unsplash and Pixabay to ensure that the diversity I was seeking would be represented. I tried to also represent this in the names I chose: Silvio, Haripal, Helena. Comcast represents 95,000 employees across the country and that diversity needed to be represented..